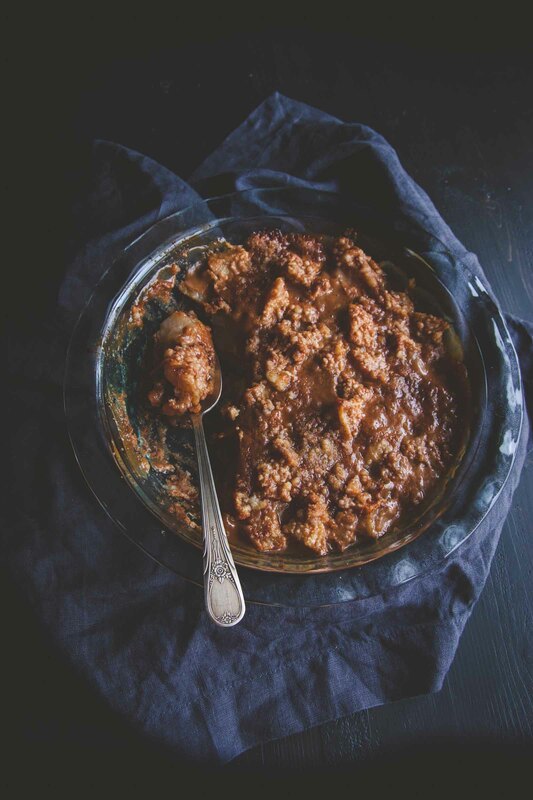 Move aside apple crumble and make way for this pear and ginger caramel crumble. 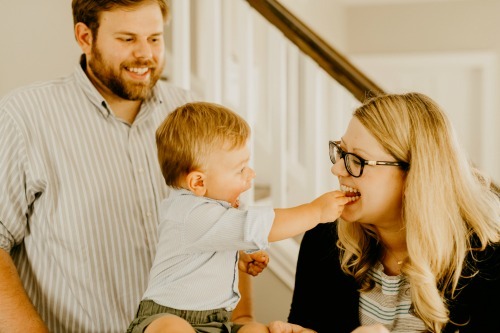 It is THE BEST crumble recipe, it’s got oohey gooey caramel and flavors of fall which everyone is going to love! The story goes, when I was a baby I would not eat apples. My mom tried everything, but I just detested apples, so she said she fed me other fruits like pears, cherries, etc. Basically anything that wasn’t an apple. And I loved pears! 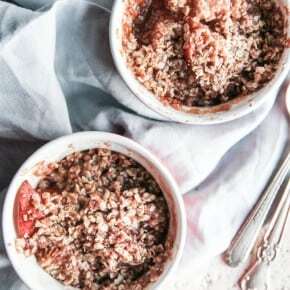 I now eat apples (not in abundance, but I don’t have a hatred of them as I did as a baby apparently) but after making this pear crumble, I know my true love of pears is ever present. Pears have a soft sweetness, and work perfectly in a crumble. They get very tender when they’re baked, and are brought to life by the hints of ginger underneath the sweet caramel and crumble topping. I love pears and ginger together, as evidenced by the recipe I shared last year of an upside down apple and pear loaf! I don’t know why I hadn’t thought of making crumble with pears before. I love fruit crumbles of all kinds, but this particular case, I had all these pears that needed using and so this recipe came to life. 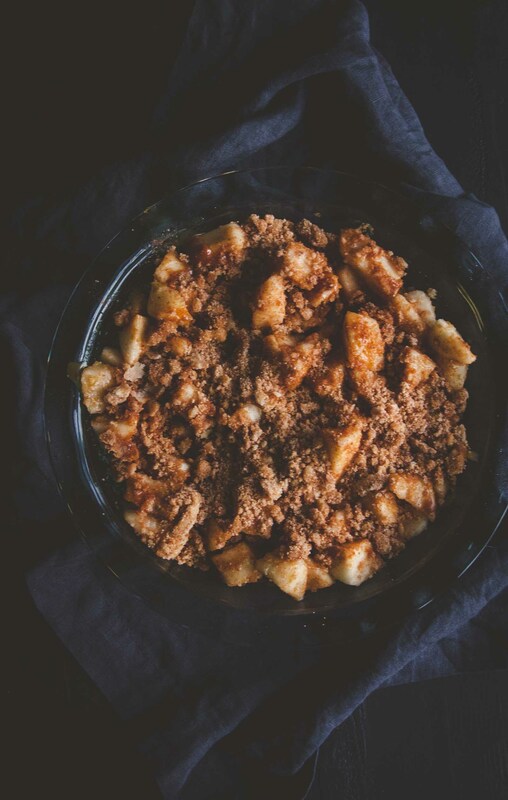 And boy am I glad it did, because this pear and ginger caramel crumble is one of the best fall desserts ever. 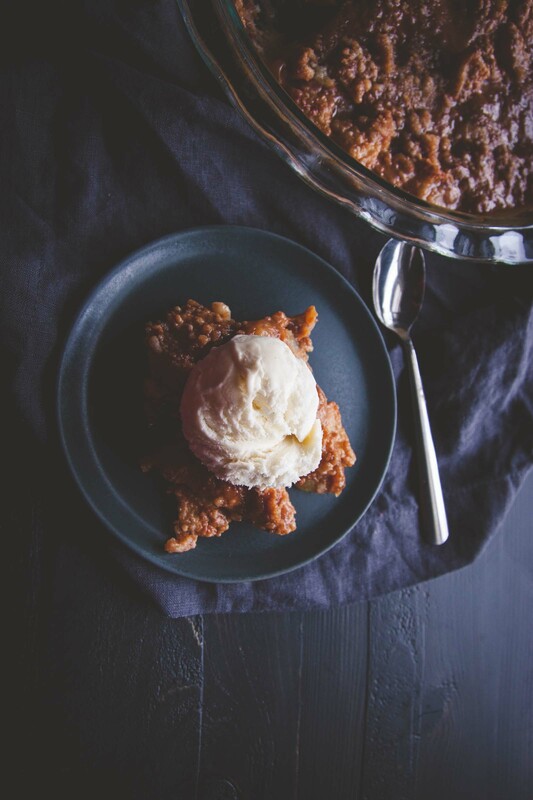 Top it with a scoop of vanilla ice cream for sheer perfection! 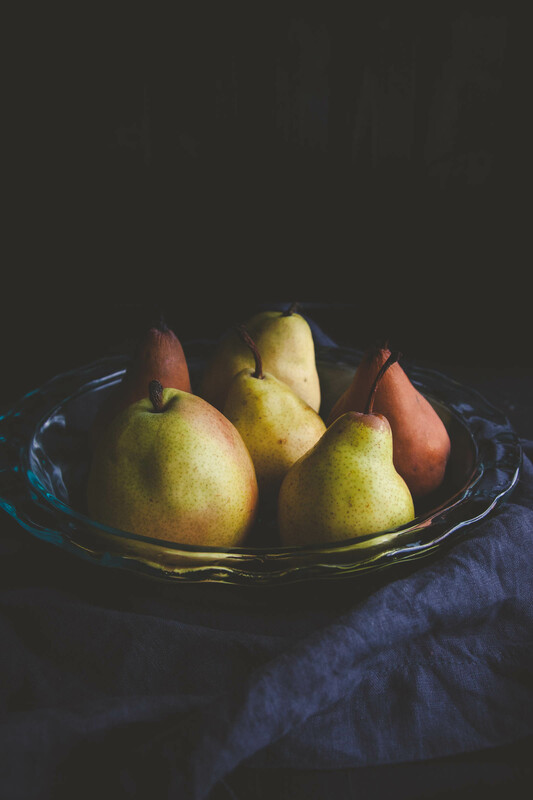 In a bowl combine peeled, sliced pears with cinnamon and ginger and stir. Spoon into a baking dish, then drizzle caramel over the pears. 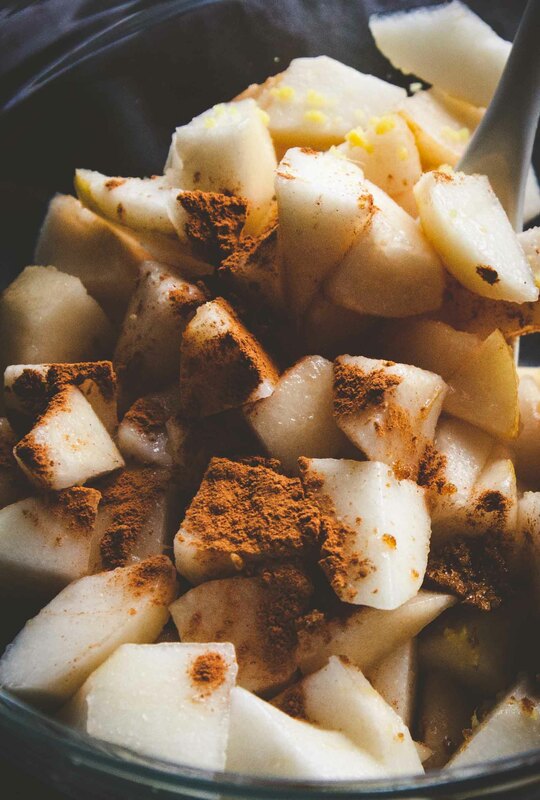 In a separate bowl combine the butter, flour, sugar, brown sugar and cinnamon, use a fork and make it into a crumbly topping, then sprinkle over the pears. Bake for 30-40 minutes until the edges are bubbly, then remove from oven and allow to cool for a few minutes. Add a scoop of vanilla ice cream if desired and enjoy! 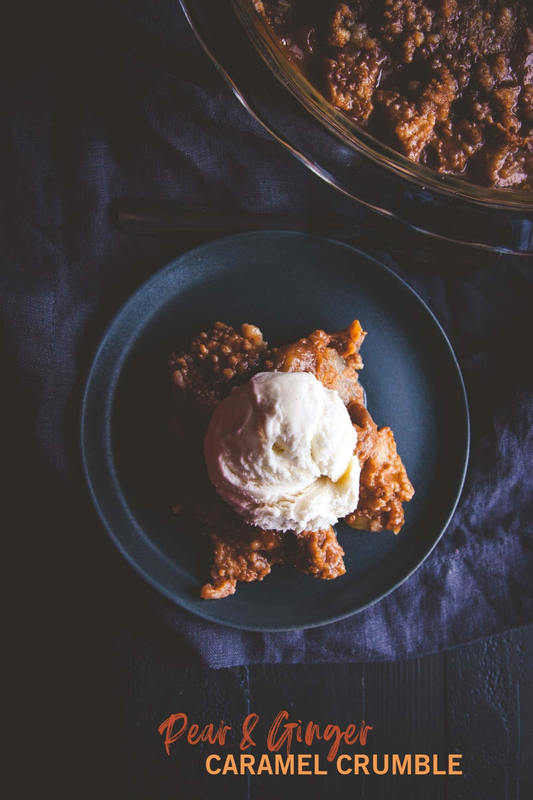 Apple Crumble -Fall is in the air! So sorry! Thanks for the comment, it’s 1/2 cup! I’ll make that change right away.